Google Chrome is easily the most popular browser on Android as it’s pre-loaded on almost all devices and thus accounts for nearly half the market worldwide. But it’s facing great competition from Alibaba’s UC Browser in markets where the Chinese technology giant is well-embedded. UC Browser is dethroning Google Chrome in emerging markets of Asia, reports the Wall Street Journal citing StatCounter figures for 2017. The report highlights the role of new internet users in countries such as India and Indonesia, who are saddled with “spotty mobile service” but are singing praises of the lightweight Chrome alternative, which clocks in at only 29 MB in terms of the download size. In these markets, UC has signed-up with OEMs and carriers to pre-install their browser app on the phone, thus eliminating the need for this small download too. 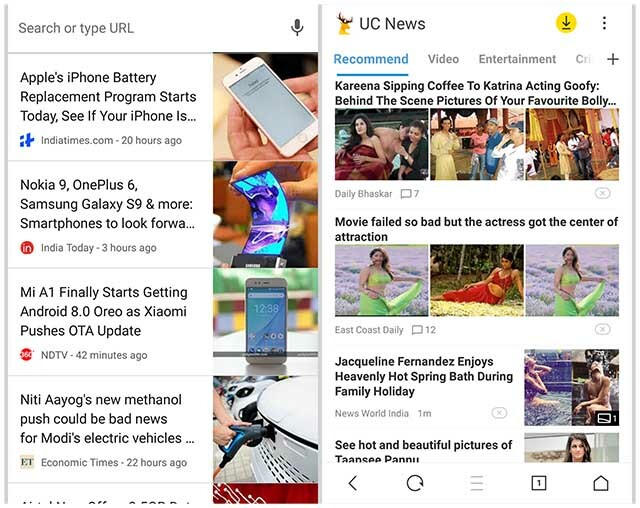 UC Browser’s UI is known to be fast and visually delighting (compared to the staid Chrome interface), and it has low requirements of RAM, something which Chrome is notoriously hungry for. So it’s naturally a popular choice for owners of low-end smartphones. In India, where only 30 percent of the 1.3 billion-wide demographic uses mobile internet, UC Browser leads with 51 percent market share compared to Chrome’s 30 percent, according to web analytics company StatCounter. Meanwhile, 41 percent of the 65 million internet users in Indonesia (out of a population of 260 million) have opted for UC Browser, compared to 32 percent who use Chrome. However, UC Browsers lags far behind Chrome with only 16% of the total market share worldwide. UC Browser edges out Chrome due to its small size and a “portal-like” approach, which bundles in content from other UC apps such as UC News. It also adds value by highlighting videos prominently as soon as you open the app. An average user thus is less likely to leave the UC Browser and move into the app to watch the video. Chrome is so well-integrated with Android that clicking a video link will likely open it in the YouTube app. This can get confusing for internet novices. There are signs that Google is trying to play catch up. It revamped the Chrome app’s home screen to show AI-generated relevant news for you. It also decreased the app’s install size, and allowed home screen shortcuts and offline reading for frequently visited pages, but this effort does not beat UC Browser’s catchy features such as ad-blocking or data compression. All this, despite Google’s gigantic bill of $7.2 billion paid to OEMs for pre-installing Google Play apps including Chrome as the default browser. The perfect response from Google would be Chrome Go. Yes, it doesn’t exist, but it really should. It recently introduced Android Go – a modified version of Android suited for low-end devices, and then developed ‘lite’ versions of apps such as YouTube Go, Google Go (Search), Maps Go, Files Go (storage and file manager) and so on. What it lacks is such a version of Chrome. Chrome Go would be the perfect thing to take on UC Browser – in fact, Google Go gives us a glimpse of just what a lightweight browser can do, but it is a little limited in its browser capabilities. In fact, Google recently introduced a “data saver” app called Datally, which can be baked into a Chrome Go version to take on UC Browser’s feature-set. For Google, it’s imperative to have a strong base in India and not let the competition run away at a time when the India growth story is about to go big-time. Many Indians are only just waking up to mobile internet and the opportunity is there for the current leaders to consolidate their dominance in the long-run by grabbing the mind-share. Google is so used to being the Internet’s “first company” that this kind of competition is rare, and its response is likely to come this year, rather than next. Another area that a potential Chrome Go can win over UC Browser are the privacy and adware concerns. Common UC Browser peeves include unauthorized data mining, unwanted notifications, and out-of-context ads. A Chrome Go would be a no-brainer alternative considering these concerns. Essentially, a Chrome Go would be the perfect way for Google to regain the lost traffic from data-deficient regions, one of the key problem areas being tackled with Go-branded apps. While Chrome Go seems to be a low-key prospect as of now, the popularity of Go-branded apps on the Google Play Store suggests the (fanciful) lightweight browser could put an end to Google’s traffic woes in India, besides offering strong opposition to UC Browser in this dog eat dog market.